Self-Acceptance Retreat, April 6-7, Johnson Woods Lodge in McDonald, TN near Cleveland. An overnight, nature-based retreat for women who have survived trauma, led by Holli Richey and Bonnie Cretton. Bonnie is the founder of Woodsong Forest School. 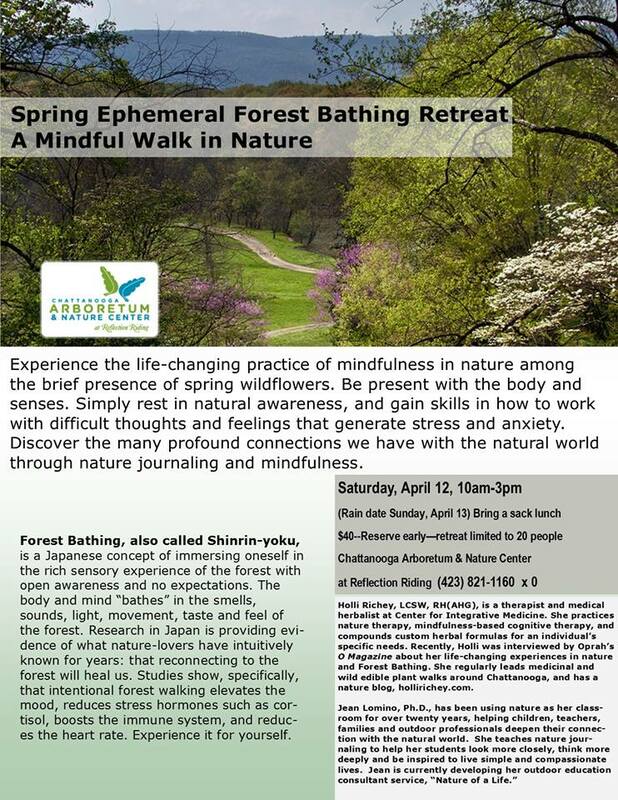 Experiences include, Forest Bathing (mindful walk in nature opening senses to nature’s elements to calm and soothe our mind and body), gentle yoga, herbal identification walks, herbal tea blends, meditation. Meals are included. Lodge setting, but must bring linens, yoga mat, comfortable outdoor clothing. Space is limited. Register with Holli by March 25th, 423-240-4578. On top of the beautiful Lookout Mountain in Northwest Georgia, we will be gathering for a wonderful herbal experience this September. I will be teaching a class on Herbs for Stress and leading a Forest Bathing experience to calm our nerves and enliven our senses. I’m excited that herbalists Ila Hatter and Lauren Haynes will be leading herb walks and teaching medicine making. You won’t want to miss this herbal gathering for women. For more information and to register click here for the Into the Wild Herbal Gathering.